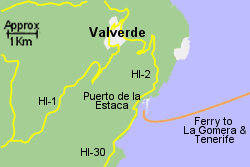 Map of the Valverde Ferry Port area. 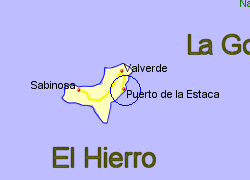 Although referred to as Valverde, the port on El Hierro island is at Puerto de la Estaca, and the small capital city of Valverde lies 3km inland. 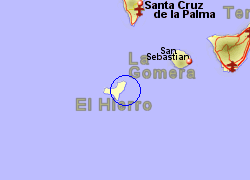 El Hierro airport lies 2km north of the port, both being vital communications for this small and most westerly Canary Island. 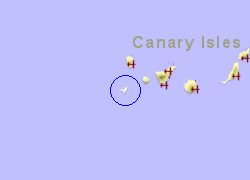 Bus services are available covering most of the island which is only 30Km by 20Km at its widest points. Operated by Fred.Olsen Express with 3 crossings per week, crossing time 2.5 hrs. Also operated by Armas with 1 crossing per week, crossing time 2hrs 40 mins. Operated by Fred olsen with 3 crossings per week, crossing time 1.5hr.